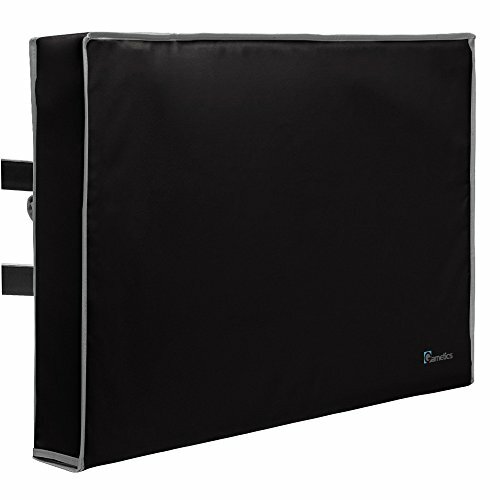 Our 40" , 42" , 43" TV Cover is compatible with most TV mount and stands with built-in pocket for your remote controller and comes with a unique soft internal fabric (not textile) to prevent scratches. While reinforced stitching means the TV Cover retains that rectangular shape. It not only protects your TV but looks good too. NOTE: TV cover dimensions: 40" W x 25" H x 4.5" D. Please measure carefully the height, width and depth of your television and compare it with the measurements above. Not all televisions are made the same so measure your tv before purchase! EASY TO COVER AND UNCOVER - just slip it over your flat TV and seal with velcro enclosures on the bottom and back. Works with 3d, 4k, lcd, led, plasma tv sets. This protector fits very well along every side of your TV set including the bottom and provides the best protection for your outdoor television. DIMENSIONS: 40 " W x 25 " H x 4.5 " D.
If you have any questions about this product by Garnetics, contact us by completing and submitting the form below. If you are looking for a specif part number, please include it with your message. Outdoor TV Covers 52" - 55" - WITH BOTTOM COVER - The BEST Quality Weatherproof and Dust-proof Material with FREE Microfiber Cloth. Protect Your TV Now!